Cami McCormick is a CBS Radio News correspondent. Only a small number of Iraqi and Coalition forces are based at the southern port city of Um Qasr, but they're guarding most of Iraq's wealth. "We realized (five years ago) we destroyed the Iraqi Navy and we needed to re-build it for their own protection," says British Royal Navy Lt. Commander Dave Walken-Gossen. "About a billion dollars a week passes through these oil platforms and that's protected by the Iraqi Navy — about 2,000 people," adds Walken-Gossen. That oil "accounts for about 90 percent of Iraq's Gross National Product... all of the money that's supporting reconstruction and rebuilding is relying on these two platforms." More than 50 British military personnel and two dozen American troops are in um Qasr teaching the Iraqis how to board ships to search for illegal cargo. The Iraqis now have 25 vessels, and they patrol these waters in the northern Gulf of Arabia daily. "We are there to supervise, but they do everything on their own," says U.S. Amy Sgt. Zaid Aws, an Iraqi-born interpreter working with U.S. and British trainers. He boards foreign ships with the Iraqis and says sometimes the crews of those vessels are surprised when greeted by the Iraqi patrol boats. "They have a lot of experience, the Iraqi Navy. They come from the former regime," he says. In contrast, "about 75 percent of the Marines are new, but they're willing to train." There were no Iraqi Marines before 2003. In the past, the Iraqis have been creative when it comes to repairing equipment. 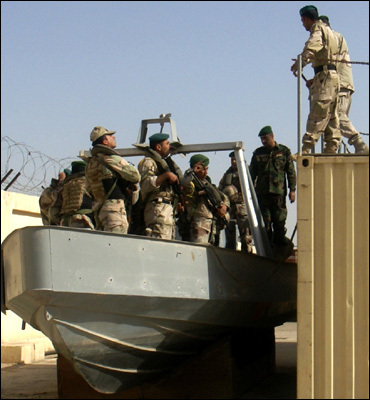 During the days of Saddam Hussein and U.N. sanctions, Iraqi sailors kept their vessels afloat any way they could. Now, British and American troops are explaining to them that keeping their high-tech new boats on the water will require following instructions to the letter. One American points to "the three propeller boat" and jokes "the Iraqis thought if two propellers worked well, three should work better." The boat sits tied to a dock, useless. Another problem, according to Walker-Gossen, is selling the importance of these forces to the government of this mostly land-locked country which has focused largely on improving security elsewhere, and not on protecting its assets down south.